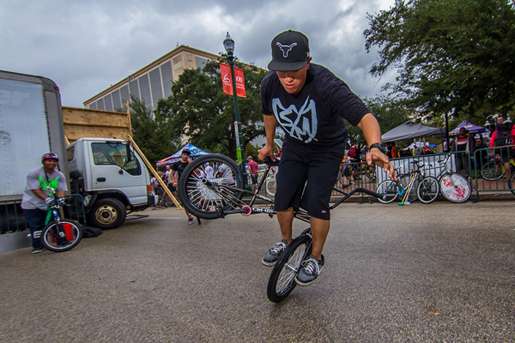 Attention all Flatland BMX riders, street riders, and fixed gear freestyle riders. There will be an all day flatland freestyle jam at this festival hosted by The Byke Project, FIKSD Apparel, and Black Gold Cycling. Come hang out all day, ride, play, and party with us. Admission is FREE with any cash donation that will benefit Love Puppy Breath Dog Rescue. There will be a 40 x 60 enclosed riding area that is free to use by all freestylers and flatlanders. There will be scheduled events taking place throughout the day in this riding area such as bunny hop contests, foot-down, and other contests, but for the most part this area will be for flatland and freestyle. Contact hectorg@htxbikefest with any questions.